Years of experience teaching blogging in elementary school has demonstrated to me that the benefits of an online platform with an authentic audience and rich peer review opportunities is an indispensable element in contemporary writing education. I have always been partial to Kidblog, but upon beginning teaching at KIST last fall, I was invited to utilize the blogging features included in Moodle, the school’s platform of choice. As my students and I used the Moodle Blog, I kept a Kidblog v Moodle blog comparison table embedded below to note features of each platform to compare and contrast them. Although it is not necessarily essential for learning writing and blogging, the design of a digital tool greatly affects the levels of engagement and enthusiasm with which students use it. Kidblog has a far more aesthetically pleasing layout, allows students to customize the design of their blogs, and includes features that resemble social media like highlighting unread posts and notifications for comments. Teachers can connect classes in Kidblog to expand the available audience for students’ posts. I have witnessed students develop personal networks of peers internationally with similar interests and writing styles. Kidblog makes peers’ blogs easy to locate and interact with. The only available audience in Moodle is the school community and posts are difficult, if not impossible to find. The most critical difference, and the one that establishes Kidblog as a superior learning tool, is the brilliantly designed privacy and moderation features. 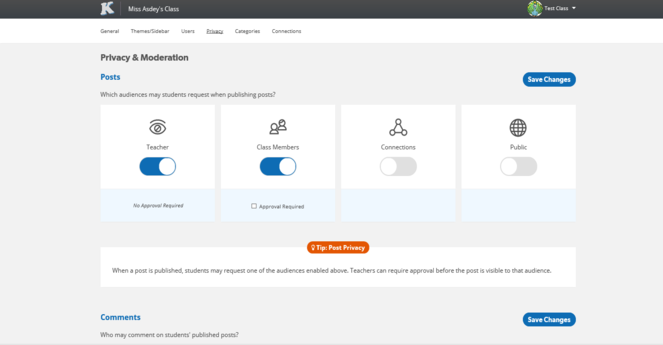 Students can choose the audience of each post as only their teacher, students in their class, community members (students in connected classes and parents), or public. This is a tremendous value as it empowers students to publish and grow their audience at their own comfortable pace. Moodle blog privacy is not adjustable. In Kidblog, teachers can control privacy globally, restricting audience levels available to students and which comments are published. This ensures that the citizenship lessons inherent in blogging occur at the discretion of the teacher. Another awesome privacy feature is for teachers to post private comments which only the post author can read and reply to. If simply having a digital publishing experience is enough, then the Moodle blog function would suffice. If blogging is to be a writing and publishing tool to learn to engage with an authentic audience and global blogging community, Kidblog is the only choice and is well worth the reasonable additional investment. For more on blogging with elementary students, please read Elementary Blogging – Start a digital footprint with both feet, Blogging with elementary students – a formative reflection, and Engaging and Authentic Student Blogging.